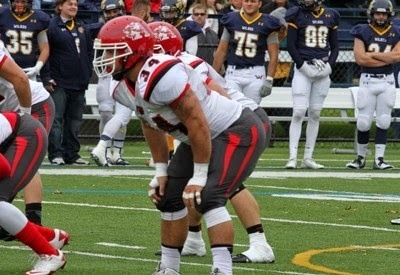 EDWARDSVILLE, Pa. -- Junior linebacker Steve Barroso batted down a two-point conversion attempt in overtime and Albright held off Wilkes 36-35 in a Middle Atlantic Conference game on Saturday in Schmidt Stadium. The pass deflection by Barroso capped a wild second half that saw the Colonels rally from a 23-0 halftime deficit to force overtime. "They stacked up the receivers and I saw Hartman, who had been beating us up all day, going to the outside and I almost bit on the out," Barroso said. "But I saw the inside receiver come across the middle and I just jumped the route." With the victory Albright improved its record to 4-4 overall and 3-4 in the MAC and won for the third straight time overall, and second straight time in overtime. "I'm certainly very proud of our guys for being 1-0 this week and getting this done in overtime," said head coach John Marzka. "I don't know if my old man heart can take much more of this, but I'm extremely proud of them for finishing this thing the right way." Albright got the ball first in the overtime period and produced a methodical march to the end zone. Chris Dawson, who had a team-high 74 yards on the ground, carried the ball six times in the drive and capped it with a three-yard scamper up the middle giving the Lions a 36-29 lead. Wilkes wasted no time in getting on the board on its possession as the Colonels found the end zone on the second play when quarterback Ryan Dailey connected on a 13-yard pass to Jeremy Hartman for the score. After a Wilkes timeout, Dailey rolled to his left and fired across the middle but Barroso knocked the pass away sealing the Lions victory. The Lions stormed out of the gate and looked like they would blow the Colonels out of the contest. Kali Boyce intercepted Dailey on the second play of the game and Albright got on the board two plays later when Patrick Wiseconnected with Gerrod Gainer from nine yards out giving the Lions a 7-0 lead. After a Wilkes three-and-out, Albright put together a 7-play, 19-yard drive that was capped by a 30-yard field goal from Daniel Sobolewski. It marked the first of a school-record tying five field goals on the afternoon for Sobolewski. Albright extended the lead to 13-0 early in the second quarter when Sobolewski connected from 41 yards out. Wise hit Vinny Williams for 16 yards on 3rd and 20, which put Sobolewski in range for the field goal. The Albright defense helped to produce the next points. The Lions held Wilkes on a 4th and 1 on its own 26-yard line, which set up Sobolewski for a 34-yard field goal to extend the lead to 16-0. On the ensuing kickoff, a short kick by Sobolewski was recovered byDanny Tighe to set up Albright on the Wilkes 29-yard line. Wise foundMalik Gilmore for 23 yards and Tighe punched it in from two yards out giving Albright a 23-0 halftime lead. Wilkes (2-6, 2-5 MAC) took advantage of two Albright turnovers to get back into the game. Omar Richardson intercepted Wise at midfield and returned it to the Albright 38-yard line on the Lions first possession of the second half. Dailey capped the 8-play, 50-yard march with a 17-yard touchdown pass to Hartman to trim the Albright lead to 23-7 with 12:28 to play in the third quarter. The Lions then fumbled the ensuing kickoff and Wilkes recovered at the Albright 38-yard line. Dailey scampered in from two yards out with 10:43 left in the third quarter to cut the margin to 23-14. Albright answered with a 10-play, 31-yard drive that culminated with a 48-yard field goal from Sobolewski that upped the Lion lead to 26-14 with 6:06 to play in the third. Wilkes got within one score of the lead early in the fourth quarter when PJ Incremona scored on an 8-yard rush with 9:18 to play in the game. Gainer returned the ensuing kickoff 61 yards to the Wilkes 22-yard line and Sobolewski drilled a 21-yard field goal that increased the lead to 29-21 with 6:40 to play. Wilkes then went on a 13-play, 66-yard scoring drive capped by Dailey finding Hartman from two yards out to bring the Colonels to within 29-27 with 2:45 left. Wilkes elected to go for two points and the tie and got it when Jonathan Conklin connected with Tim Bousson on a reverse pass to knot the score at 29-29. The Lions appeared poised to win the game at the end of regulation. The Lions drove to the Wilkes 28-yard line aided by a 26-yard pass from Wise to Gilmore and lined up for the game-winning field goal. But the field goal attempt by Sobolewski into a stiff wind came up just short sending the game into overtime. "When you have a kicker as good as Daniel you have a lot of confidence in the fact that you just have to get close and you are going to come away with points," said Marzka. "I had a lot of confidence that he was going to make a 44-yard field goal to win the game but the wind was just too stiff. He did a great job today and that is just tremendous. That whole unit has done a great job with Ryan Wade as the holder and Grant Boehler as the long snapper. That is one of the more reliable units we have on the field." Albright returns to action on Saturday (Nov. 8) when it hosts Misericordia at 1 p.m. at Shirk Stadium on Senior Day.